Down load The Story of Emily the Cow. Recent article about Emily the Cow. – Will Tuttle, Author, Activist, Peace Chaplain and recipient of the Courage of Conscience Award. 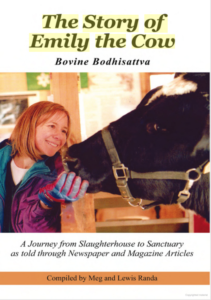 Emily the Cow gained international attention after escaping a Hopkinton slaughterhouse in 1995. 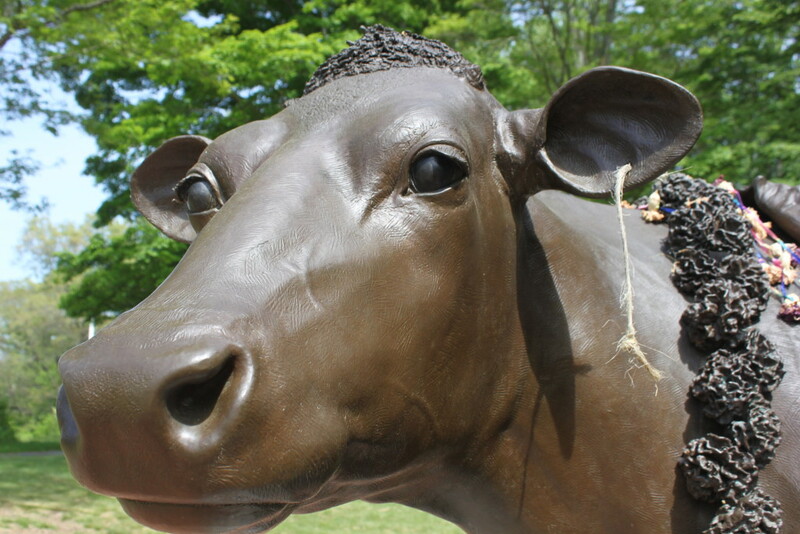 Bronze statue of Emily the Cow at her grave in Sherborn, MA. Emily’s story is one of survival, perseverance, and inspiration. After hearing of Emily’s escape, Meg and Lewis Randa, Life Experience School co-directors, brought her to live at the Peace Abbey. Emily served as a loving symbol of courage, inner wisdom and survival to thousands of people who came to know and love her. After eight years in town, Emily died March 30, 2003, of cancer. A life-size bronze statue adorned with a blanket and flowers, Hindu signs of respect, stands at her eternal resting place, where Emily the Cow will live on as a symbol of vegetarianism, humanity, and nonviolence.Emily served as a loving symbol of courage, inner wisdom and survival to thousands of people who came to know and love her. She encouraged many to embark on the road to vegetarianism and cruelty-free living while inspiring people to appreciate the sacredness of all life. Emily’s gentle and loving nature imbued us all with a better understanding and respect for all creatures with whom we share this planet. This is her legacy. Emily’s spirit will live on in the hearts of minds of those who were touched by her grace and beauty.Hair clippings from Emily’s markings on her forehead and from the tip of her tail, traces of her blood and a piece of golden thread (placed through Emily’s ear by Hindu priest Krishna Bhatta of the Lakshmi Temple) were released into the holy river Ganges in the city of Benares, India. Abbey members Bram and Elizabeth DeVeer organized and assisted the Temple priest in this traditional sacred cow ritual on the Ganges River in April 2003. 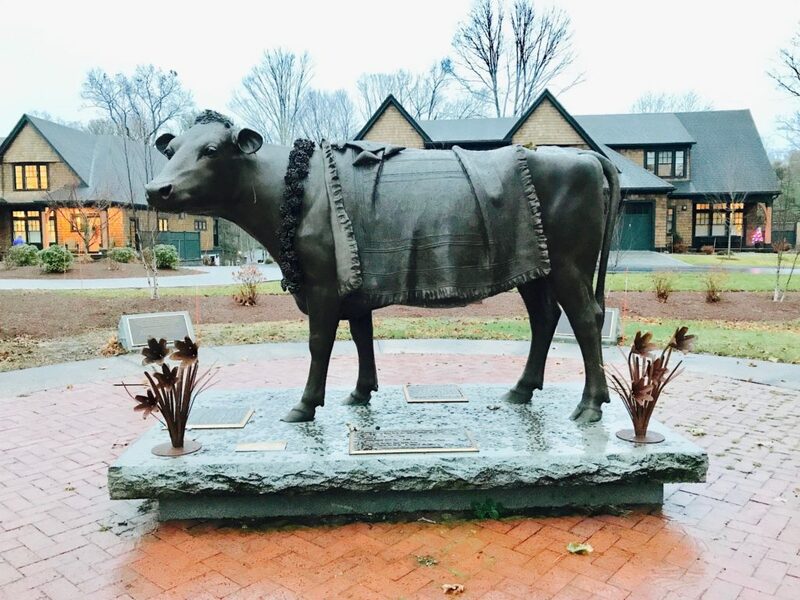 The Animal Rights Memorial in honor of Emily the Cow is owned and under the care of The Life Experience School in perpetuity. The Story of Emily the Cow is available on Amazon or at Barnes and Nobles. All proceeds go for the care of Emily’s Memorial. In Emily’s memory, we offer “Veggie Couching” and a crash course in becoming a vegetarian/vegan. Five-minute cable news segment on Emily the Cow.